The reason it has taken me so long to write this entry, after Adrian tagged me back in February, is that I was waiting for a bit of news to become public so that I could talk about it. Of course, I didn’t really have time to make it public, so that took too long, too. But it finally happened, as you’ll see in Number 5. From August 1988 until March 1989, I lived as a volunteer at Kibbutz Dafna in Galilee Elian (upper Gallilee). This was one of the most memorable experiences of my life, and I’ve actually been meaning to blog about it for a while now. I arrived at the Kibbutz with only a few bucks in my pocket, but with a note saying that I’d been accepted as a volunteer. I moved into a small room in “Death Row” with another American who’s name I’ve long since forgotten. Within a few weeks, I’d been selected by the barman, Johnny Howarth, to be his co-barman (not what I was called, but that’s memory for you). We ran a small bar just for the volunteers and interested Kibbutzniks in a small bomb shelter just across the roads from Death Row. Yes, really. We served Goldstar beer very cheaply (The kibbutz got it wholesale and we charged slightly more just to drink for free ourselves) and really bad vodka and rum to the few who wanted it. Most of the volunteers were English or Scandinavian, with a sprinkle of Americans and other sorts thrown in (we also had 10 Thais living with us for several weeks), and nearly all of us were 18-28 year-olds who liked to drink as much as possible and get laid. I wasn’t quite the hero that Chad was in my brief time running an establishment, but, ah, what a life! About the same time I started tending bar, I also got a larger room that for all but three months I had all to myself. For those three months, I shared it with an Aussie, Andrew Jeffreys, with whom I became very good friends. He later (1990ish) came and stayed with me at my Mom’s house in Sacramento for several months. I spent my time on the Kibbutz driving a tractor (only one volunteer got this honor—most worked in the boot factory), mopping the dining room floor with the giant electric mop, getting drunk, and dancing the night away every Friday night at the Kibbutz disco (later named “Domino”). Great life for a 19 year-old taking a year off from college. I was even “adopted” by a Kibbutz family, visiting with their two young boys, who were very big on Michael Jordan (hi Esti!). I finally came home in the Spring of 1989 after a short tour of Egypt and upon hearing that my mom was very ill (she’s fine now, thanks). It was a good time to go, anyway, because I rather felt that my brain was beginning to rot. There is not a lot of intellectual stimulation in a Kibbutz environment. Still, it was an amazing time for me. Before I was an über geek open-source and Web app hacker, I was an Archaeologist. The summer before I went to Dafna, I worked for six weeks at Tel Dor on the coast of Israel as a volunteer. I loved doing archaeology. So much so that when I finally returned from Israel and sobered up enough, I went back to school with a vengeance, earning my BA in Anthropology from the California State University, Sacramento. In 1994, I started the graduate program at the University of Virginia, intending to earn by Ph.D in anthropological archaeology. I participated in excavations in Israel (three more seasons at Tel Dor—I met my [now] wife, Julie, there in 1992), Cyprus, and southeastern Turkey (Kurdistan, essentially). I really enjoyed graduate school. Reading journals and writing essays really appealed to me, and the vigor of the debate in a graduate seminar full of smart people was absolutely invigorating. I finished my three years of course work, picking up my MA after two, and continued auditing graduate seminars a fourth year, just for the hell of it (I particularly enjoyed The Anthropology of Science and the archaeological theory seminars). But as I started casting about for a dissertation topic, I could find nothing that really appealed to me. What I really enjoyed was debate and theory (hence my nickname and the title of this blog), and counting bone fragments the size of my toenail just didn’t do it for me. I was a theorist among a gang of Michigan-trained empiricists. And I agreed with them that I needed to do something “real” on which to build my career. But frankly, the problem was that such things just did not interest me. The summer following my fourth year, I accompanied my advisor, Pati Wattenmaker, to Kazane Höyük, outside of Sanliurfa, in southeastern Turkey. At that time, I already had a job for the University’s medical center doing integration programming in Perl, and was getting my first experience with databases (Access and SQL Server). Going into the project, I suspected that I was done with archaeology, but the fact that, after we came in from the field each day (I have always enjoyed the excavation part of archaeology), I found much more pleasure in creating an Access database for the tracking of vast quantities of data than I did in plowing through, categorizing, and entering in that data (read: counting pottery sherds). So in the fall of 1998, I left the program ABD, and in the summer of 1999, Julie and I moved back to San Francisco. Julie and I moved from San Francisco to Portland, Oregon, in 2004. Of course many of you already know that, but do you know why? The reason is that we were looking for a change of lifestyle. We loved our SoMa loft in San Francisco, but not the neighborhood so much. There are only so many times we could tolerate coming home to find that someone had pissed on our garage door. And don’t even get me started on hypodermic needles. Julie and I wanted to start a family, and much as we loved our home and lifestyle in San Francisco, we knew it wasn’t right for bringing up a child. In truth, we had thought about Portland since 1996, when I was still in grad school, and we even visited for a few days. When we visited again in December of 2003, we had a real estate agent show us some homes, just to get a feel for the neighborhoods and what not, with the idea of maybe moving to Portland in a few years. But she showed us a house that we fell in love with, we mad an offer, and the rest is history. 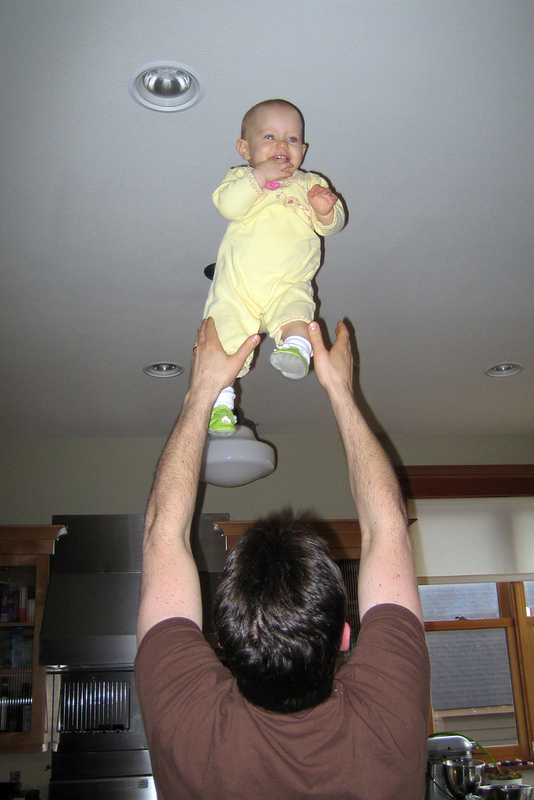 Just a few months after our move to Portland, Julie got pregnant, and our daughter, Anna was born on May 13, 2005. She’s nearly two now, and she’s the light of our life. What a joy this kid is! She’s smart, has a great sense of humor (yes, an 18-month-old can be funny! ), and keeps us on our toes. I couldn’t be happier; we lucked out and got a real gem of a daughter. We expect to have fun with her for the rest of our lives. Here’s the big, recent change: I now spend my days as a Ruby hacker for Values of n, working with my friend Rael Dornfest building Stikkit and, more recently, i want sandy. Kineticode is still around, accepting only Bricolage support contracts—no more consulting. I remain the maintainer for Bricolage, but I’ve thrown down the gauntlet to get other people to step up an start to drive the project more. So, Ruby, eh? And Ruby on Rails? Yes. Rael chose to use these technologies before I started working with him, and they were the right choices. And have I found the Ruby religion? Well, no, not really. There are quite a number of things I like better than in Perl, but none better than what will be in Perl 6 (someday, sigh). What I miss most from Perl are sane Unicode support, fantastic regular expression support, and lists (yes, *lists*—as opposed to arrays). And what of Ruby on Rails, you ask? It seems like a fine Web application development environment. The controllers and views are nice. But I’ll say no more. You’ll have to buy me an awful lot of beer for that. I’ll take Goldstar.